We understand the majority of inmates who have been in and out of the system possess minimal health literacy. Most have been self-medicating and haven’t received sufficient medical and mental health care through their lives. Our healthcare program offers an opportunity to enact meaningful, lasting change, and make a genuine difference with our patients, their families and in the communities which we serve. CorrHealth’s team-members provide quality and professional patient care based on every inmate-patient’s specific medical need(s). We do so without inquiring about the patient’s charges, passing judgement and/or prejudice. Providing compassionate care does not mean being sympathetic, nor does it mean giving our inmate-patients what they want. It simply means treating them our inmate-patients with respect, treating them with dignity and properly, utilizing the basic healthcare services without compromising our duties to our inmate-patients, our team-members and the Counties and communities which we serve. partner-providers. 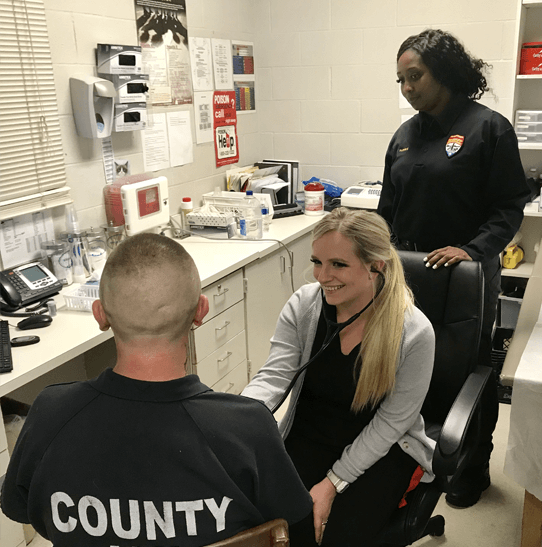 Providing adequate and compassionate healthcare is what we do, it is who we are and the compassionate manner in which we serve is important to our inmate patients and their families, our team-members and in the communities which we proudly serve. CorrHealth delivers quality and compassionate care, our patients matter, and providing our patients with quality, professional and compassionate healthcare programs and services are yet another essential component of our “Doing Right”. Don’t take our word for it, please review our Testimonials and References section to read how we provide compassionate care to our inmate patients.